Warlords Crystals of Power is a five reel game that has 30 lines. This is the new game that was released by Net Entertainment. The game takes players on an amazing adventure that is full of action, rewards and fortunes. This is because the game is themed around the war of the Crystals of Power. This great war was between three powerful warlords, each commanding a massive army. Each warlord wants the stones to control the world. As the game is from the portfolio of Net Entertainment, it comes packing many special features and icons. These special bonuses guarantee players a highly rewarding experience. Warlords Crystals of Power is a Net Entertainment game. This is why it is not a surprise that it comes in outstanding visuals, animations and sounds effects. All of them help create quite an immersive ride that is like none other. These visuals depict the theme of the game. This starts by the animated intro clip that will explain the theme of the game, the different warlords and the crystals of power that they are after. There is the Hammer Warrior, the Priestess and the Samurai. They all seek to acquire the crystals of power and they will use their massive armies to do so. Players will see these armies marching into battle around the reels, which is set in the battlefield. The symbols appearing on the reels include the three warlords that can appear in stacked symbols to cover an entire reel showing the entire warlord. There are also the war banners of the different warlords and their favorite animals. These animals are the dire wolf and the wild boar. There are also different weapons like the hammer, the bow and the samurai sword. All of them come in great designs and can be animated whenever they are a part of a winning combo. 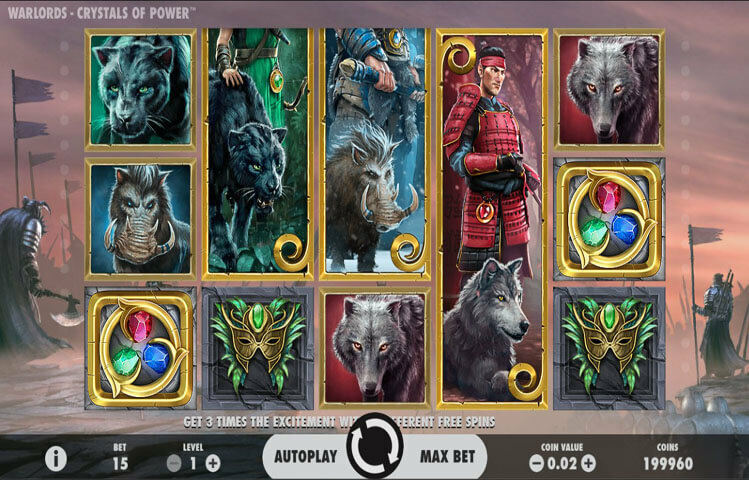 Warlords Crystals of Power is a bonus packed slot machine. This does not come as a surprise since the game is developed by none other than Net Entertainment. The first special icon is the wild symbol. This wild icon comes in the shape of the Crystals of Power icon. This wild will substitute for all symbols, except the scatter war banners of the warlords, to help players form a winning combo. Speaking of the banners, there are three war banners. Each one has the weapon of choice that represents each warlord. So there is a bow banner, a samurai sword banner and a hammer banner. Three of the same scatter would activate the free spins round. The game also has 3 more special features. There is the Battle Bonus, there is the Last Chance feature and the randomly activated Wild Patterns. The last one gives players multiple wilds across the reels to help them get a reward.